Amongst Manhattan's array of thrift stores, few have the quirk and charm of the City Opera Thrift Shop. 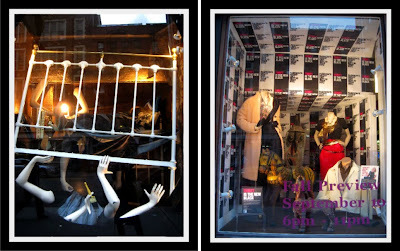 This Bergdorf Goodman of secondhand stores lures you in with it's gorgeous window displays - courtesy of the students of the nearby School of Visual Arts - and offers up an assortment of upscale designer wear. The collection of dresses, women's shoes and men's suits make it an excellent place to shop for a special occasion. The styles on offer cater nicely for all ages; I can imagine bringing my mum here (and her squealing in delight at the velvet jackets and silk dresses). There are plenty of clothes for us younger types too, when I was there last a young woman was trying on a cute fitted leather jacket. If you want a Dior jacket this is the thrift store to visit - but if you're looking to stretch your last 20 dollars as far as you can you might want to steer clear. 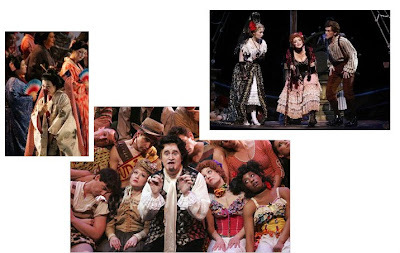 The New York City Opera supports groundbreaking opera and has 25% of tickets priced at $25 and less - now that is thrifty. 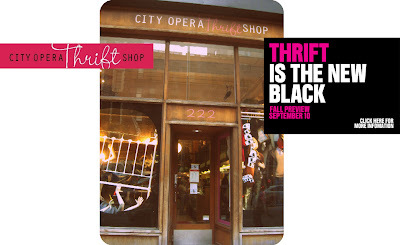 The New York City Opera thrift store is on East 23rd Street. 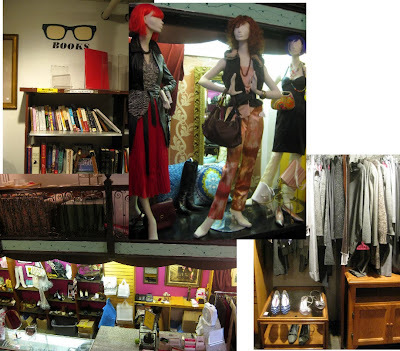 As well as women's and men's clothes and shoes, they have furniture, books and often opera records and posters. Summer, are you leaving already? As I cling onto summer for dear life, here is a look from earlier this year, boots thrifted in Chelsea flea market, belt thrifted at housing works and an urban outfitters dress with a retro feel to it. Summer, please stay! 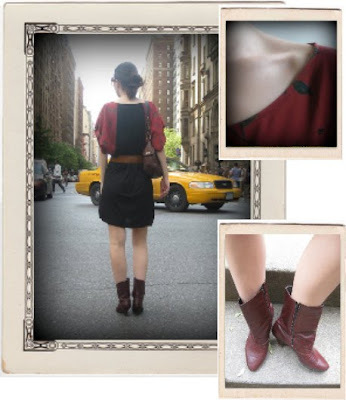 In NYC you can feel a little nip in the air signalling that summer is ending, EEEeeeek! There are loads of things to see and do and there are summer clothes I haven't even worn yet. In an attempt to do the things we've been procrastinating for ages, the boyfriend and I set off on an impromptu "Do everything weekend". First and foremost on the list - Coney Island. Wow. I get that funny NYC feeling that I've been here before having seen it in the movies and on TV so many times. It is a sight to behold. Trashy, over the top, fun and community oriented, all in one. The beach is full of families and the water seems crowded with grannies, aunties, fat men in Tshirts, muscular men in tattoos and snotty children. We stroll around taking in all the sights. I'm wearing a red dress I bought at a fleamarket in Buenos Aires, Argentina. From the beach we head over to Wonder Wheel, the large ferris wheel. Feeling brave we get onto the cyclone - frankly just to be able to say that we have done it. 90 secs on the ricketiest roller coaster and we go through the feelings of elation, fear and dread. And then it's over and our legs are shaky and we cannot stop giggling. Then of course we have a Nathan hot dog and then the freak show - with ALIVE acts from Serpentina (lady with large snake), a sword swallower and fire swallower, a bendy woman on an electric chair and other assorted oddities. I'm afraid there was no thrifting done in Coney Island - although imagine the crazy goodies you would find there! The next day, we head to Governor's island and rent bicycles. The views of Manhattan are amazing - this is a must do summer trip. It is 5 minutes away from the city and it feels you are miles away. I'm all thrifted in a red silk dress I got at the greenflea, handbag and bangle (from junk man at the greenflea) and shoes from a thrift store on the Upper East Side (the Spence Chaplin thrift store). And guess what?? There are no thrift stores on Governor's island. That should come as no surprise because this enigmatic piece of prime NYC real estate is uninhabited and exclusively for public purposes.